The team at Parker & Hammond Opticians have won a prestigious national award. After being shortlisted to four practices in the UK and the only practice in London, Parker & Hammond Opticians were announced winners in the category ‘Optical Team of the Year’ in the AOP Awards 2019, which is organised by the Association of Optometrists (AOP). The Awards, now in its eighth year, recognises the highest levels of achievement in UK optics. 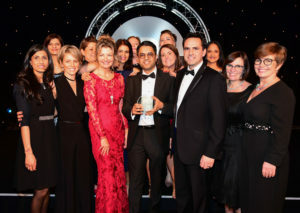 The Optical Team of the Year accolade, sponsored by Lloyd & Whyte, celebrates an optical team dedicated to delivering the best possible patient experience in the practice.